Happy Friday, friends! This has been a week. I am frantically trying to get things prepped for the new baby – whether that means getting ahead with work projects, having stuff installed in the house (we just received a bunch of our light fixtures!) or just trying to finish up the nursery. It feels like the weeks are flying by! I’m officially 36 weeks pregnant and I had Charlie a week early soooo, I’m kind of feeling like this could happen whenever. Eek. Anyways, I’m trying to slow down and enjoy these last few weeks as a family of 3. Thanks for all of the great questions this week! Can you share your registry essentials? I am newly engaged and so overwhelmed by the process of registering. What are your tried and true favorites? Anything you wish you had registered for? Anything you wish you hadn’t? Hmmm. I would say our most loved items from our wedding registry were a good coffee maker, a quality set of cookings pans, luggage and nice towels. My husband and I have been married for 10 years this December and got married in a courthouse ceremony. We are having our pictures taken to celebrate and I’m wearing the long, navy, strapless dress that I was married in. We are taking the pictures outside in a couple weeks and since it’s November in MN, I’m wondering if I should try to find a shawl or something to wear with my dress? What do you recommend? So special! I would recommend a pretty pashmina (I love the pink vivacious, blue stone and ivory colors) or something like this faux fur stole would feel like a special update to your dress! Did you like your pregnant body? How did you come to embrace it? I have been feeling like pregnancy is such a loss of my old body that it’s hard to get excited about the changes even though the baby will be the best gift possible. The first time yes, the second time, not so much. I think a big part of it was working so hard to get my body back after baby only to have it change again. But, let it serve as a reminder that you can and will get your old body back – and maybe it will provide motivation to make your body even better. Something magical happens when you have a baby. Not only is it an amazing gift but you’re so proud of your body for carrying and creating this tiny human. You are more gentle on yourself but you also know that you can push yourself a little harder. It’s motivation to be stronger and healthier for your child! Plus, it’s only 9 months. Give yourself some breathing room, time to enjoy the bump and heal after baby arrives. What are your suggestions for new mom lounge wear at home? I know I’ll be breastfeeding and will want to be comfortable, but also look presentable for when family and friends stop by to visit. ThirdLove just sent me their new jogger set and I feel like I’ll be living in it all winter. They sent me the pink and I think I may order the black, too. I also bought this maternity PJ set (I love the nursing tank!) and I think I’ll switch out the robe for a cozy cardigan when I know visitors are stopping by. My absolute favorite leggings are the Lululemon Align leggings (the best) so you’ll probably see me wearing those, a loose tee and cardigan most days. Just wondering why GAP isn’t one of your choices for outfits or links very often (if at all)? I know you do Old Navy sometimes. I just feel like Gap and Banana Republic are your style! (& those three stores are so connected corporately, that I feel like the later two or more you as opposed to ON). I do shop at Gap on occasion! But personally, I don’t think their products hold up well in the wash. Also, their pieces tend to run a little shorter so I haven’t purchased much since finding out I was pregnant in February. As far as Banana Republic, I actually pop in their a lot but I always feel like their styles are a little dressier than what I need! If I were working in the corporate world I think I would definitely shop there more often. However, I find I dress more casually these days and Old Navy is a great spot to shop for Charlie, too, so I tend to shop their more often (Gap Kids fits so wide and Charlie is a peanut)! Also, I swear Old Navy’s tee’s and sweaters hold up in the wash.
My husband and I want to get better at taking pictures with our new camera. Are there any You Tube videos or helpful tools you and Dave used to perfect your camera skills/images? You guys always take such GREAT pictures! Thank you so much! It is a constant learning curve when it comes to figuring out what we like/what works for our brand. When we first started shooting with a DSLR I read some bloggers recommendations and learned the basics from a few Pinterest tutorials. Blogging 4 Keeps has some great photography tips! I will say that practicing and shooting together more often over time has been the biggest help. Most of the time we still have no idea what we are doing but we do have a few things that seem to work – we like to shoot in the shade, we keep the shutter speed above 250 at all times (to avoid camera shake), we keep the aperture low to get a crisper outfit (usually around 2.2-2.8 for a blurry background) and we will bump ISO a bit if we need more light. If we are shooting details we bump the aperture up to around 4.5/5 to get all of the items in the image sharp and then adjust the other settings accordingly. I am looking for Kids Play Tables or Activity Tables? Did you get one for Charlie? Yes! So many questions about the train table we got for Charlie’s 2nd birthday. It is the KidKraft Mountain Train Set from Amazon and Charlie LOVES it. I’m pregnant with my second and starting to show a little earlier than last time (ok a lot earlier!) going to a wedding around the time I will be 11 weeks. Any suggestions for a cocktail dress that will work with a small bump? You can’t go wrong with a simple black dress and fun earrings. A lace dress would add some dimension and camouflage a small bump – I love this and this. I love the sleeves on this shift dress (my go-to silhouette when I’m preggo). I just recently found out I’m pregnant with baby #2. What are some items you’ve traded out during your pregnancy or things you’ve let slide (coffee??) the second time around. I’m sad to give up my prescription retinol (can’t wait to see ALL the wrinkles), so do you have any really good products that work well without all the good stuff that’s not allowed? I have been way more relaxed this pregnancy (as you may have noticed on social media). I get asked this a lot but I continued to drink coffee throughout both of my pregnancies. With Charlie I stopped drinking coffee for 2 weeks but was getting such terrible headaches that my doctor told me to have a small cup a day, which I did. With this pregnancy, I felt so sick in the mornings throughout the first trimester that I really didn’t drink any coffee but I did pick it up again once I felt better around 12 weeks. I usually have 1/2 a cup in the morning and then maybe 1/2 cup in the afternoon (rarely). I’ll also have a regular coke here and there because it helps with my headaches. I’ve also had sushi a few times, turkey sandwiches and a few glasses of wine. I think I realized with this pregnancy that I am generally a healthy person and everything is in moderation. In terms of my beauty routine, I would say the most important part of your skincare should be keeping your skin moisturized. Being pregnant steals all of the moisture in your skin and we all know that dry skin leads to wrinkles. Making sure you stay on top of it should help! You’re obviously not going to be working to reverse anything but here are a few products that I love: Arcona Triad Pads, Elemis Superfood Facial Oil, M-61 Hydraboost Serum and Tata Harper Restorative Eye Cream. My mom, mother-in-law, and sisters-in-law are hosting 3 baby showers (first baby excitement!) for my husband and I over the next few weeks and I’d like to get them each something nice as a thank you. Do you have any favorite gift suggestions? I always think Dogeared has the sweetest necklaces that anyone can layer with pieces they already own. I personally love this simple pearl pendant. Mark and Graham has some great personal options like this travel jewelry case (doesn’t every woman wish she had this?) or a leather zip pouch. I wanted to get your opinion on rain jackets! I have a sporty Patagonia torrent shell type but wanted to see if you had any ideas on a more a-line, dressier version, that actually keeps you dry in a good rain storm! A few of my favorites are: Barbour Cirro Waterproof Hooded Jacket, Barbour Wytherstone Rain Jacket (seen here), Petite Bateau Raincoat and the Stutterheim Stripe Raincoat. I was hoping you could share some ideas on winter clothes you plan to pick up for Charlie. I have an 18 month old and live in the NYC area and now that he is constantly on the go I am hoping for suggestions on outerwear for the winter, especially shoes! I’ve already purchased these UGG boots (seen here, these little sherpa trim boots (a steal! ), he has these mini classic Hunter rain boots (with these socks) and oh my gosh look at these! This little sweater is super cute and I ordered this coat for Charlie to wear this winter. I also spotted this cute hat/gloves set at Target! How did you keep yours & Dave’s closet/clothes organized in city-sized apartment closets? Do you have any closet organization tips? We were lucky to have a huge storage unit in the basement of our building so all of our clothes were switched out seasonly. We also had a pretty big walk in closet (rare) and Dave had a separate closet in Charlie’s room for his suits/golf shirts. I also happen to be a little crazy and every time I buy something new I like to give something away. I hate when I can’t comfortably scroll through my clothes on their hangers. We also have a good sized dresser where all of our basics, activewear, denim, etc. live which helps save on space! How has Charlie’s behavior changed as you get closer to your due date? My 2 year old son has been so clingy lately. He wants me all the time, and only me (not my husband). He has been waking up and wanting to sleep with me and he wants me to hold him the entire time. I’m just curious if you’ve been experiencing any of this. If so, how have you been dealing with it? I haven’t noticed a change with Charlie yet but I’m sure once our new baby is here I will! Charlie is a pretty independent little boy but also has FOMO if we aren’t around. He is still sleeping well and doesn’t seem to be phased by anything coming (he is in for a rude awakening). I wish Charlie wanted me all the time, ha! I’m looking for a classic everyday tote that I can use for work and travel. I’ve been looking for one with a zipper closure and preferably under $300. Do you have any recommendations or brands that you love? I would highly recommend the Cuyana Oversized Carryall Tote (so beautiful) and I still love a good Longchamp tote! I was wondering if you posted that recipe, I think from last week, with the butternut squash? Also, will you be posting the chili recipe you made? It looked amazing and I need some new recipes to try. The butternut squash noodle recipe I made (on my insta stories) can be found here! The chili we made the other night can be found here! How do you wake up so early and keep up the energy? As I get older I find myself getting tired much more often. The struggle is real. Half of the time I wake up early because I have insomnia when I’m pregnant. This usually means I wake up around 3:30 and can’t fall back to sleep. I’ll sleep pretty soundly for 6 or so hours and then my eyes are wide open. Other times I’ll roll over, look at the clock and if it is 5am I’ll force myself to wake up to get some work done before Charlie is up. It is really the only time I get to myself on days with Charlie – where I enjoy my coffee in silence or catch up on the news. If I can (usually this doesn’t happen because I’m trying to shower, work, clean), I’ll take a 10-20 minute cat nap during Charlie’s nap to keep up my energy. Otherwise, lots of water and lots of outdoor time. I also try to get in bed by 9pm at night. #grandmastatus Honestly, sometimes as a mom I feel like you learn to have this strength where you can do anything on very little sleep. Insomnia during my pregnancy with Charlie helped me prepare for this (with the newborn stage) and I’ve just kind of embraced it. Also, this Natural Calm Magnesium supplement helps me to sleep like a baby. My mom and I find a new fun and festive cocktail to serve every Thanksgiving that we host, but we are kind of struggling this year…any suggestions? If you start this weekend, you could make my recipe for Cherry Bounce! Mmm – so cozy all winter long. This Pomegranate Ginger Paloma looks delicious or PureWow shared the ultimate fall cocktail guide and they all look amazing! Good Secret Santa gifts? We haven’t set a limit yet, but I imagine it won’t be more than $40. How adorable is this holiday travel mug? I also love these heart mittens, this holiday doormat and this boozy hand towel for guests. Love reading these, especially Q&A’s about motherhood/pregnancy. Definitely noting those for future reference. As this is my first pregnancy, I was worried about what “not” to eat/drink as well! I’ve learned from friends and family that yes, there are precautions, but moderation is key. If I get a latte, I’ll do half caff. If I want mayonnaise, I make sure it’s not homemade (raw eggs) and it’s store bought which IS pasteurized. I’ve also heard that if you eat “good” sushi, you should be fine – just no gas station sushi – lol. I don’t crave sushi any way so this isn’t an issue for me. 🙂 Love the posts, Liz!! I’m so intrigued by the Cherry Bounce recipe! But I’m at a loss as to where to store it for a month #smallkitchen. Can it be mixed and poured into mason jars to sit? Advice appreciated!! 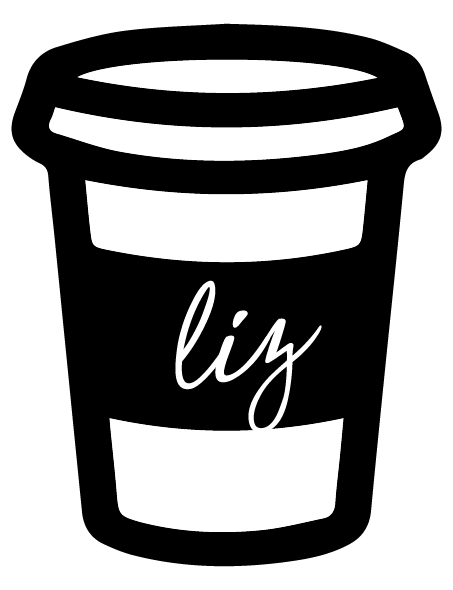 Another amazing Coffee with Liz! I was the same with my 1st pregnancy, the sleep just got less and less and I chose to believe it was helping me to prepare! I can’t believe how close you are now! So excited for you and your family! Lululemon Align pants are without a doubt the best leggings. I love mine for working out and lounging!